Alstom have chosen the route between Buxtehude and Cuxhaven, as the launch route for their hydrogen-powered Coradia iLint train. I’ll now look at the route. Buxtehude station is on the outskirts of Hamburg. There is a double-track electrified line through the station. There appears to be a West-facing bay platform, which conveniently has what looks to be a train in DB red, in the platform. Line S3 of the Hamburg S-Bahn between Pinneberg and Stade. This line appears to be electrified with 15 KVAC overhead wires. Service RE 5 between Cuxhaven and Hamburg via Otterndorf, Stade and Buxtehude. This route is only electrified between Hamburg and Stade. Service RE 33 between Cuxhaven and Buxtehude via Bremerhaven and Bremervörde. This route is not electrified. Service three is the one that from yesterday has been run by the Coradia iLint trains. I followed this route in my helicopter and it is a single-track line through reasonably open country with in places trees along the line. If this line was in the UK, it would be something like the Breckland Line or Great Eastern Main Line. through Norfolk, both of which have an operating speed of between 140-160 kph. So I wouldn’t be surprised that the Coradia iLint could be almost at its maximum speed of 140 kph for long periods between stations. This Google Map shows Bremervörde station. It would appear to be on a large site and there might even be a depot. There’s certainly space to add a couple of large wind turbines to generate electricity, that could be used to create hydrogen through electrolysis. As with the line to the East of Bremervörde, it is fairly straight across what appears to be fairly flat and through a mixture of open countryside and woodland. 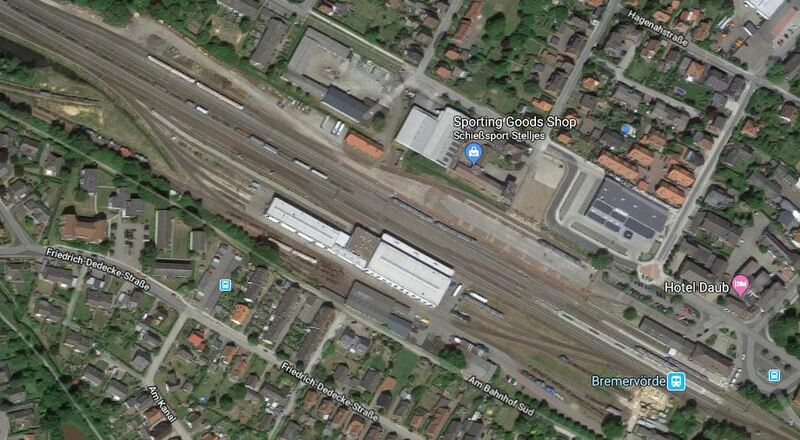 This Google Map shows Bremerhafen Wulfdorf station. The line from Buxtehude can be seen joining from the East. The line is electrified to Bremerhafen HBf station. 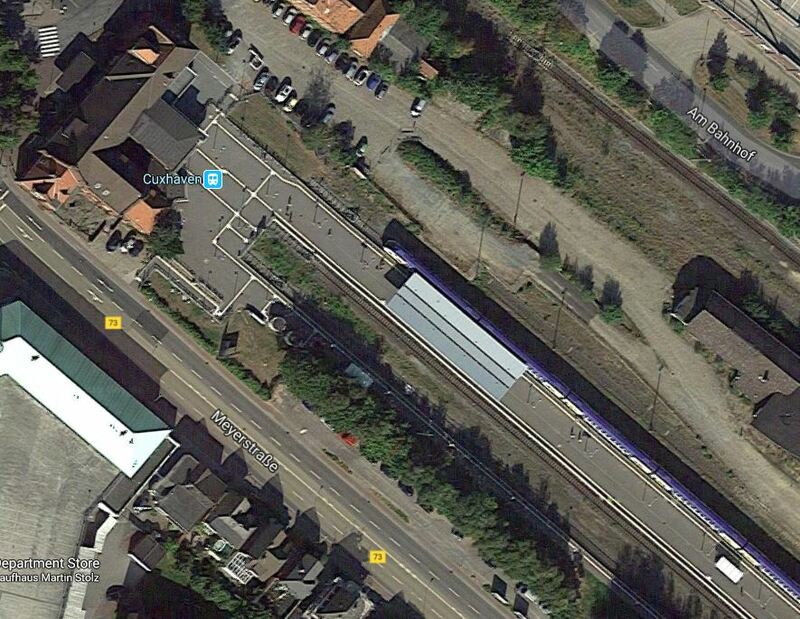 So will the Coradia iLint trains change to overhead power at Bremerhafen Wulfdorf? 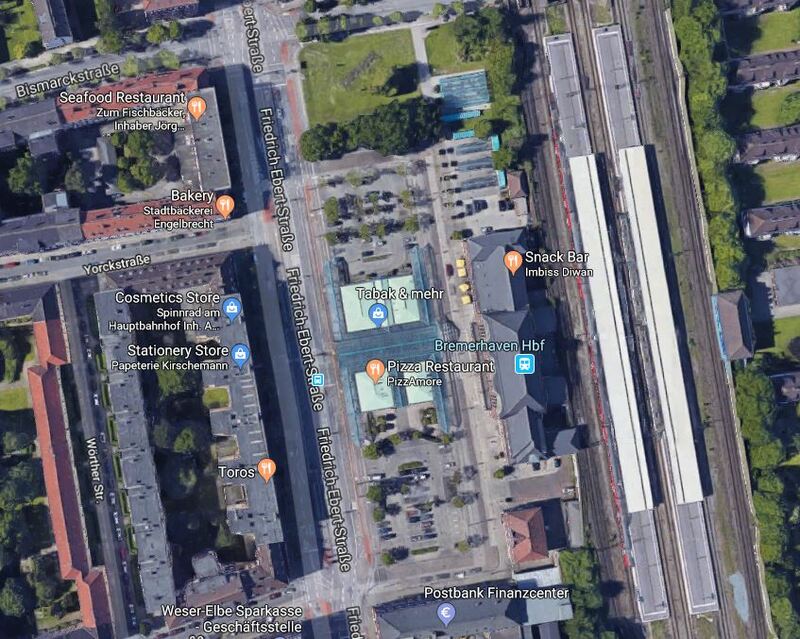 This Google Map shows Bremerhaven HBf station. It looks to be a typical functional German station with four platforms, which are all electrified. The electrification continues Northwards for a few kilometres, but once out of Bremerhaven, the line becomes single track without electrification. 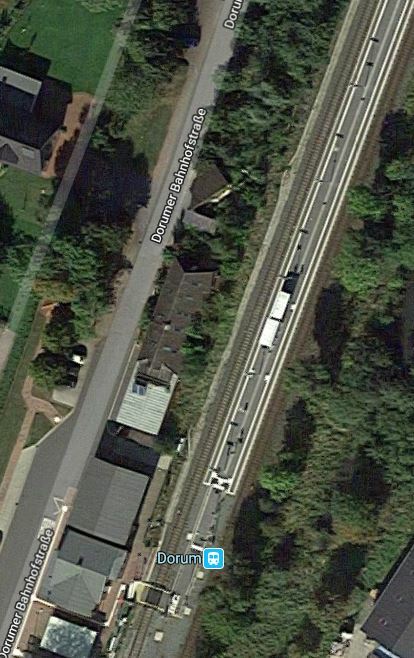 I found this passing loop at the two-platform Dorum station, shown here on a Google Map. Note how the tracks go either side of an island platform. I suspect there are other places for trains to pass or they could easily be created. The route ends at Cuxhaven station, shown in this Google Map. In addition to the service to Buxtehude, there is also a another service on a shorter and more direct route to Hamburg along the estuary of the River Elbe. Summing up this section of the route. It is single-track with at least one passing loop. There are just four stations. It is electrified for a few miles at the Southern end. I’ve also never seen a line with so many level crossings. The current service is hourly, with what looks to be these timings. Turnrounds are the following times. This gives a round trip of five hours and thirty-five minutes. So it would appear that at least five Coradia Lint 41 trains are needed to provide the service. From what I can find on the Internet, the Coradia Lint trains are diesel-mechanical units, where the wheels are driven directly from the two diesel engines. I’m not sure, but the engines may be mounted under the cabs! I suspect that the hydrogen-powered iLint trains could be driven by simply replacing the diesel engine, with a suitable traction motor. What surprises me, is that there appears to be no plans to fit a pantograph to the iLint, so that the intelligent brain on the train can use overhead electrification, when it exists. This would mean that the range of the train on hydrogen would be increased, if the route was partially electrified. On the Buxtehude to Cuxhaven route, using electrification could be used to advantage to power the train and charge the batteries through Bremerhaven, where about ten kilometres is electrified using 15 KVAC overhead wires. Also, in Buxtehude station, which has 15 KVAC electrification on other lines, the bay platform that it appears will be used for the hydrogen-powered trains could be electrified to charge the batteries, during the twenty-eight minutes, that the train is in the station. Perhaps, they could use a system such as I wrote about in Is This The Solution To A Charging Station For Battery Trains? A similar system could be installed at Cuxhaven. Surely, it is better to use the turnround times at each end of the route to charge the batteries, as this means less hydrogen will be consumed and the train’s range on a tankful will be increased! There is an interesting comparison to be made here, with a route, I know well in the UK; Cambridge to Norwich. Both routes are around 100 km. Both routes are fairly flat and reasonably straight. The operating speed of the UK line is 140 kph and I suspect the German line is about the same. The UK line has six intermediate stops, whereas the German route has fourteen stops. Both lines are run by diesel trains with similar operating speeds. But the UK route is timed at one hour and nineteen minutes, as opposed to the two hours thirty-four minutes of the German one. The German route does have twelve more stops, but even if two minutes is allowed for each stop, that doesn’t explain the difference. The German route must be run at a slower speed than the UK one. As the Germans improve the speed, journey times will surely reduce. I am led to the conclusion, that Buxtehude to Cuxhaven route is an ideal route on which to test hydrogen-powered trains, but that as the trains develop, journey times will reduce substantially. I think Alstom are marketing the iLint simply as an environmentally friendly version of the Lint, substituting nasty horrid diesel with nice clean hydrogen, and adding batteries for storing power from braking. It may well be that at some point they add an additional electric/hydrogen bimode model for routes which run partly under OLE, but that does make for a more complex system – i.e. more to go wrong – besides adding to the weight. The most complex thing in a diesel/electric/battery hybrid or a hydrogen/electric/battery hybrid is lowering and raising the psntograph at the appropriate point. I was talking to two Thameslink Class 700 drivers last week and they say this is now very reliable and quick. You should remember that I’m a trained Control Engineer and the sort of decisions the train computer will take are simple compared to those taken in some of the advanced jet fighter aircraft. I was in a group using more complex control algorithms on chemical plants in the 1970s. But it must be the way to go, as it increases the range of the onboard fuel. The mathematics of charging at a terminal platform from a 15/25 KVAC supply are also very good and enable 80 kWh to be put in the batteries in about five minutes. I remember seeing photos and film of vehicles converted to run on hydrogen in WWII and they had big bags of the gas on their roofs. Now they are building trains to run on it. Seems to me to be a no-brainer as the exhaust is just H2O – water. My only concern is that a tank of hydrogen is like a bomb. What could happen in a crash if the storage tanks rupture? You could get a huge fireball. I am sure this is being taken into account in the design. I hope. I used to work in an ICI plant at Runcorn, that made hydrogen along with chlorine and sodium hydroxide. The danger was not the hydrogen, but the mercury they used in the electrolysis process. ICI used to transport the hydrogen away in trucks and the plant is now owned by INEOS, who are thinking of adding it to the natural gas supply in the area for high energy users. I actually think, there was an episode of Dad’s Army with a bag of gas on the roof of Jones van. there’s some discussion of the risks compared to diesel at https://blog.ballard.com/hydrogen-safety-myths. That was one of the issues that the German rail safety authority looked into before approving the iLint for public use, and they wouldn’t have approved it if they thought the risks were high. I’m no expert, but if the risks are similar to or less than those of diesel, that’s good enough for me. Here in GB the National Infrastructure Commission recently recommended substantial research into replacing current natural gas supply to businesses and homes with hydrogen. That would solve the hydrogen distribution problem, as you could use the current gas pipes. There are gas explosions too, but the risks are small if installation and handling is properly organised and regulated. Some of the worst gas accidents in recent years have been with propane. But as you say, if handling is good, there should be no problems. Very interesting Article Peter, thanks for the link. Thanks! Going to have a look Sunday and Monday!